Launching in 2015, YesBets.co.uk is another matched betting service which is holding its own against the big boys of the industry such as OddsMonkey, Profit Accumulator and MatchedBets.com. We’ve signed up to YesBets Premium to find out what they have to offer and take a closer look at their tools and matched betting service as a whole. How much does YesBets cost? New customers of YesBets can try their service out at no cost by signing up for their free membership. The free subscription gives users access to two bookmaker offers which they say will make you a profit of up to £40. The two offers are from Ladbrokes and Coral which offer new customers £20 & £30 in free bets and so £40 profit should be perfectly achievable with an 80% retention of the free bets. If you wish to gain access to all of the offers that YesBets provide then you will need to sign up to a premium membership at the cost of £14.99/m. Currently, YesBets do not offer annual memberships. Along with having access to over 50 new customer offers, being a premium member comes with a few other perks such as access to their Facebook community and daily reload offers to continue to earn a daily profit after you have completed the new customer offers. We’d recommend signing up to the free trial if you’re new to matched betting to get a feel for the website. There’s a number of video and text guides that explain everything you need to know about matched betting before getting started properly with a premium membership. 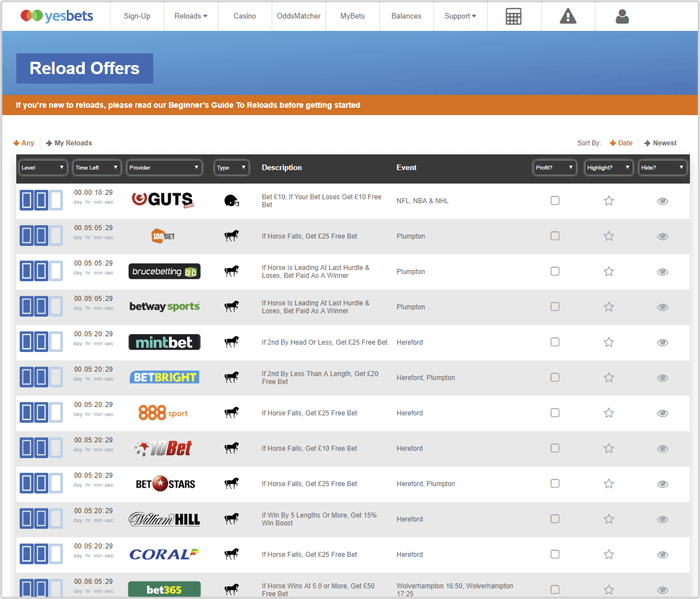 When first logging into YesBets, you’ll see a number of bookmaker offers to complete. If you’re on a free subscription, only the Coral and Ladbrokes offers will be accessible but you’ll see the other bookmaker offers available to premium members greyed out below. At the time of writing the review, there was 54 bookmaker new customer offers listed in the premium area, along with a number of bingo offers and a handful of casino offers. The YesBets website isn’t the most attractive and the homepage does seem quite ‘cluttered’. However, I was pleasantly surprised at the functionality of the site once I logged in and got to grips with the features and tools. You will have to watch some of the instructional videos before completing the offers which I found a bit of a pain. I can understand why YesBets do this as they want to make sure that users understand what they are doing before they get underway with depositing and placing bets to avoid mistakes. However, people who have done matched betting before will no doubt find this a nuisance. This leads me to believe that YesBets is aimed mainly at beginners rather than seasoned matched bettors. There are a lot of video guides that are slotted in between the new customer offers. I found the videos simple yet to the point and they covered a number of common matched betting subjects which will be helpful to those starting out. Some of the subjects covered are ‘ What is Liability?’, ‘What to do when the odds change’, ‘Maximising Profit from Offers’, ‘Mug Betting Basics’ and many more. YesBets offer a number of tools to premium members such as their odds matcher, horse racing matcher, each-way matcher and a number of matched betting calculators for various offer types. We’ll take a closer look at some of their tools below. Members can either access the odds matcher via the nav bar or via the individual offer pages. YesBets embed their odds matcher into their offer pages and pre-configure it to the terms and conditions of that specific offer so that it only displays matches that are relevant. MatchedBets.com do this and we found it very helpful in saving time and avoiding mistakes by placing a bet on a selection that does not meet the requirements of the offer. You may find when accessing the odds matcher for the first time that there are not many bookmakers listed. However, you must add a balance to each of the bookmaker accounts which you have open in order for them to show up in the odds matcher results initially. However, you can use the filter option to select a specific bookmaker and display the matches for them. This is a feature I am not at all keen on but again can see why the YesBets team have done it this way. By only displaying results from bookmakers which you have completed offers for means that you won’t be shown results for bookmakers which you don’t have accounts with and therefore are not useful. However, if you are joining YesBets and already have active bookmaker accounts, it is a pain to manually add each one to your account just so that their odds are shown in the odds matcher. I would prefer a selection tool to display all bookmakers or only ones that you have completed offers on YesBets for. However, the odds matcher works very well and is laid out in an attractive and user-friendly format. It took us a while to find the filter options which can be accessed via the gear icon in the header of the odds matcher. Users can filter the results by sport, market, bookmaker, exchange, event time, mix/max odds and by minimum profit from the match. There is a good range of sports integrated into the odds matcher. Users can find matches from 10 sports, including, football (soccer), horse racing, tennis, golf, cricket, American football, Ice Hockey, Basketball, Rugby League & Rugby Union along with a choice of the four main betting exchanges. Betfair, Smarkets, Betdaq and Matchbook. There are also an impressive 133 bookmakers listed, giving users an excellent choice when completing offers from some of the smaller bookmakers. When filtering results, users can only select one bookmaker/exchange/sport from each category which is disappointing. You may want to display results for multiple bookmakers which are running the same offer but there is currently no option to do this. We would like to see checkboxes rather than a dropdown list to select multiple filters as we have seen on odds matchers from other matched betting sites. When you have found a match, simply click on the ‘+’ symbol which will open up the calculator, displaying the selected odds and required lay stake and liability. Once you have placed both your back and lay bets you can click on the ‘Confirm & Save’ button which will save your bet which can be updated when the events have finished. Once the event you have selected has finished, you can go back to your selection by navigating to the ‘My Bets’ section and clicking on the ‘settle’ button. From here you can mark which of your bookmaker and exchange bets won and lost. By doing so, YesBets will automatically update your total profit which is displayed on the user dashboard. As well as tracking and displaying the total profit a user has made, YesBets will also track the balances of each of your active bookmaker and exchange accounts. To set this up you simply have to update each account when you have made a deposit or withdrawal and YesBets will do the rest. You can view your balances by clicking on the ‘Balances’ tab in the nav bar. This is a nice feature to keep track of where your funds are as it can be easy to forget about a bet you have placed at a bookmaker which you do not use regularly. You can also view all of your past bets by clicking on the ‘MyBets’ tab. You can reopen each bet and make edits to the bet details which will update your overall profit and bookmaker balances accordingly. 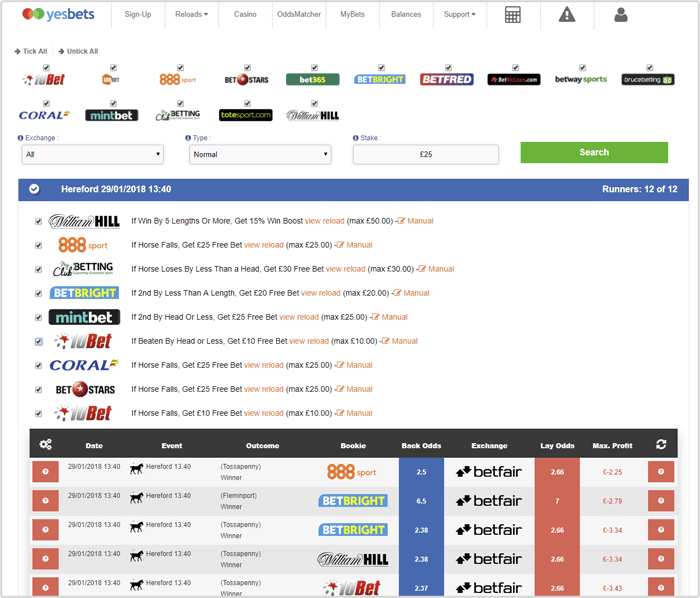 The Racing Matcher from YesBets displays matches for horse racing offers from numerous bookmakers. 15 to be exact. You can filter the results to display specific bookmakers, exchanges and update the expected profit which is displayed by entering your stake size. The racing matcher works well and is laid out in a similar style to the odds matcher in an attractive and user-friendly style. You’ll be able to view the current odds for horses running in the selected races and view the qualifying loss for each selection. The Horse Racing Matcher tool makes finding matches for these specific offers a lot quicker and easier and we were impressed by the number of bookmakers and offers integrated into the matcher. YesBets have an Each-Way Matcher tool that is currently in BETA. The e/w matcher searches for each way bets that can be backed and laid for potential profits. The matcher works in a similar way to the odds matcher in that you can filter the results by bookmaker, exchange and race time etc. There is also an option to only display matches for ITV races and races in which bookmakers are offering extra places. 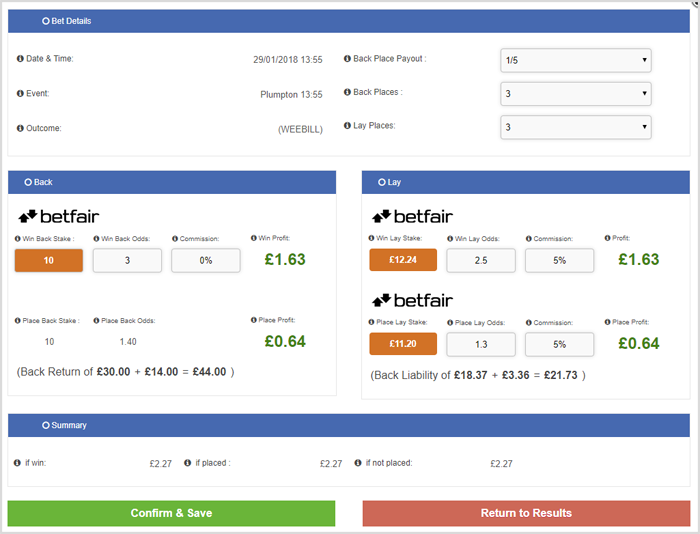 Backing and laying each way bets is a slightly more advanced method to standard matched betting but the YesBets each way calculator makes it as simple as possible. After finding a match, click on the ‘+’ icon to open up the calculator. The odds will be pre-configured into the calculator for that match and it will display your lay stakes for the win and the place markets. Clicking on ‘Confirm & Save’ will save your bet which you can mark as won/lost once completed to update your total profit, bookmaker and exchange balances. Reload offers are added to the YesBets website on a daily basis and can be accessed via the ‘Reloads>Feed’ tab in the navigation bar. 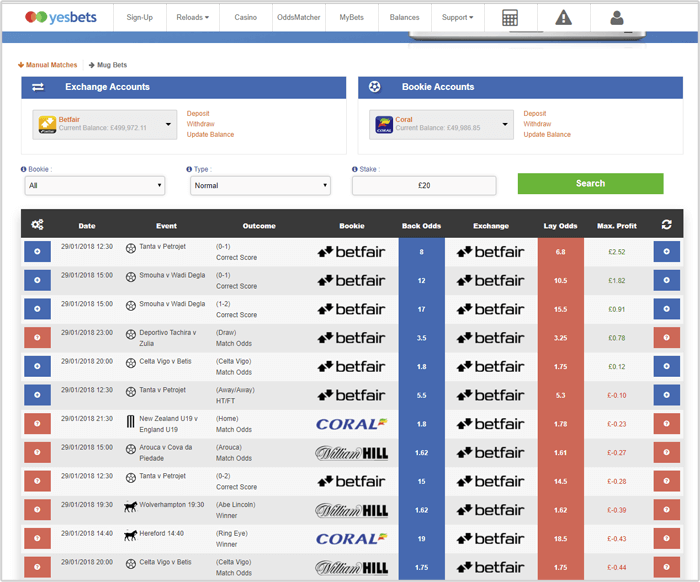 The reload offers are displayed in list-style and can be filtered by difficulty, bookmaker, expiry time and by sport. We particularly like the countdown displayed next to each offer displaying how long you have left to complete the offer before it expires. It saves having to look through the T&C’s of the offer to see if there is a specific end time throughout the day. There is also an option to filter the results by guaranteed profit and not guaranteed profit. A lot of matched bettors do not like taking the chance with potential profit offers and prefer to stick to guaranteed profit offers. This filter option will save them some time in picking out the best offers for them. There are a good number of reload offers listed and we were pleased to see a healthy number of guaranteed profit offers for the day. We would like to see the guaranteed profit or expected profit listed alongside each offer as it may not be possible to get through all of the offers each day and so a user may want to pick out the most profitable offers to complete. The offer guides for the reload offers are very brief but they do display the key points of the offer. The T&C’s for each offer are also accessible via a link to the offer page on the bookmaker website. 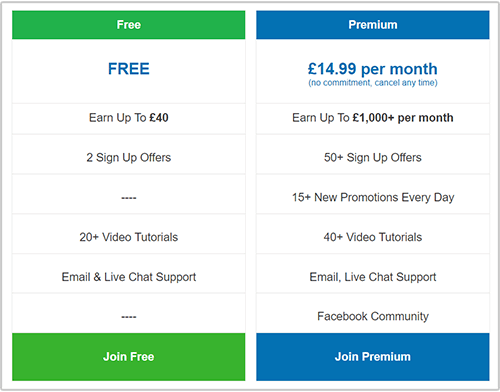 By the time a user gets around to starting the reload offers they should be used to how matched betting works and the various offer types and so I believe this is why the offer guides on the reload offer pages are less detailed. YesBets is one of the few matched betting sites to offer customer support via live chat. MatchedBets.com also offer this service and it can be extremely useful to beginners who need a quick answer to their question or help with one of their bets. At the time of writing this review, live chat support was offline on YesBets and so we can’t comment on when this feature is available and how efficient it is. When opening live chat, the displayed message pointed us in the direction of the YesBets Facebook Group which they say is the best place for a quick answer. Support is also available via email where YesBets aim to reply to queries within 24 hours. We’ve found this to be accurate and the support team got back to us within 12 hours with a prompt and informative response to our query. If you wish to promote YesBets via your website, social profiles or by simply recommending them to friends and family, you can sign up to the YesBets Affiliate Program and earn commissions for each new member that you refer. YesBets pay affiliates 50.3% commission of all net payments from members that you refer after VAT has been deducted. For example, a monthly subscription to YesBets is £14.99 and so if you refer 1 customer you will receive 50.3% of (£14.99 – VAT) which works out at £5.93 commission for every month that they are a premium member at YesBets. We were pleasantly surprised at the features and tools available with a YesBets membership. Their website and matched betting tools are pleasing to the eye and very user-friendly and all of their tools work well. We particularly liked the balance-tracking feature and the countdown timer displayed for each reload offer. There is a good number of bookmakers integrated into their tools and they seem to add a good number of new reload offers to the site daily. Putting aside a couple of minor flaws such as the lack of ability to display multiple bookmakers in the oddsmatcher using the filter and the expected profit not being displayed next to each reload offer, we would recommend YesBets for anyone starting out with matched betting.